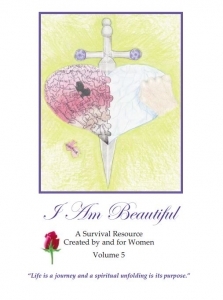 The following blog post was written by Geneva, a female inmate, for Volume three of the I Am Beautiful book series. The writings throughout this book series are the original work of the brave women inmates who courageously submitted their stories and art. Our goal is to present their work in their voice. the tape plays through again. often shines in her wide eyes. And they still cut like glass. It is our hope that everyone who reads this book will be encouraged and strengthened to stand up, count themselves worthy of dignity, and see themselves as beautiful within and without. The I Am Beautiful project represents the personal contributions of women inmates across the country who sent us their writings and art regarding their experiences of abuse. This work is their personal writing and art. The project encourages them to express their past experiences, their road to survival over abuse, and their opportunity to make a difference in the lives of other women in prison who have experienced indignity and violence at the hands of others, often from those who were supposed to love them.